A new blog, published on both wordpress (thanhlemisa.wordpress.com) and tumblr (thanhlemisa.tumblr.com), has been created to provide information and translations of the liturgical texts of the Extraordinary Form in Vietnamese. The creator of the blog had a good deal of difficulty finding a Missal, partly because the climate of Vietnam is extremely humid, which is bad for books, and one which he did find was in very bad shape; partly because not many editions were needed or made before the Council; and partly because many Catholic books were destroyed by the Communists, or had to be gotten rid of by their owners to avoid persecution. The Ordinary of the Mass has been scanned and uploaded, and the author is continually adding the Sundays and major feasts. Here are a few images sent in by the author. 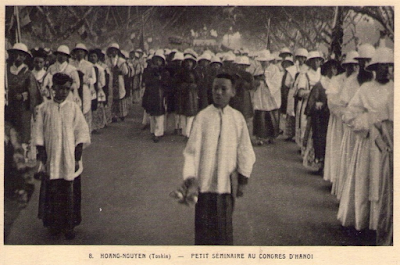 The first is of a procession during a Eucharistic Congress held at the Cathedral of St Joseph in Hanoi in 1931. Note that the priests are wearing hats in procession, since in Vietnam, it was considered shameful for a man not to wear a head-covering. (One of our quizzes was about liturgical head-coverings in China, where a similar custom prevailed.) 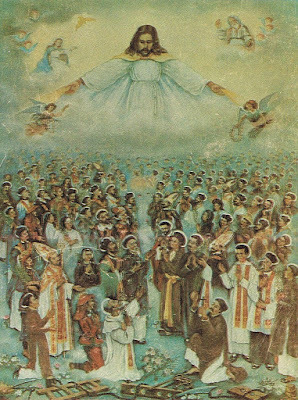 Below that is seen another view of the same procession, with the minor semiarians at the fore, and below that, a devotional image of Christ and his Vietnamese flock.